Raise your hand if you want to know a perfect method of landing a guest post, article, or even the perfect job. If you know how to write the perfect pitch, you’re on the path to success. It took me a while to realize that I’m really good at writing pitches. I don’t think I’ve ever had a guest proposal refused. And of course, I’ve received hundreds of guest proposals here at WritetoDone. Some great and many abysmal. So I know a thing or two about writing pitches. The key to a successful pitch is honesty and respect. With your pitch, you are building a bridge to another human being. And that bridge can only carry weight if it’s built with integrity. 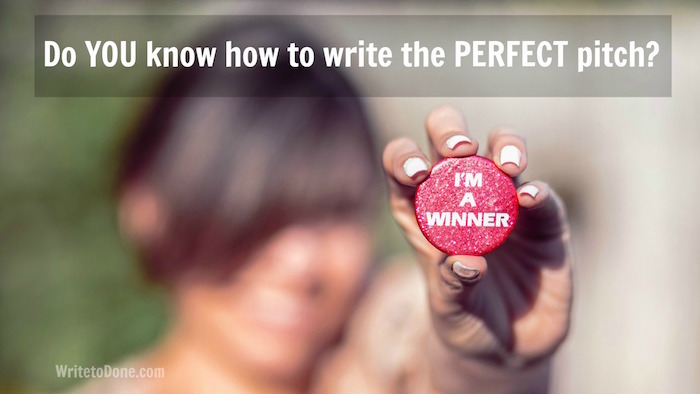 Here are 20 key points on how to write the perfect pitch. 1. Research the blog or company you’re targeting. If you’re planning to write a guest post for a particular blog, you need to research the target blog very carefully. The same applies if you’re pitching for a job; you need to find out as much as possible about the company. 2. Leave thoughtful comments on the target blog. Before you send out an email, make sure the blogger gets to know you. Leave some thoughtful comments on the target blog or on one of their social media accounts. If you want to pitch an article for a blog or a magazine, make sure you study the guidelines. 4. Remember that you are an equal human being. The person you are writing to may have more experience, knowledge, or success. But remember that you are a person worthy of respect as well. 5. Research the person you’re addressing. If you’re a blogger wanting to land a guest post or a freelancer wanting to snag a gig, study the ‘About’ page and read the articles this person has written. Mine their social media presence. What are they interested in? What topic might be of interest to them? What is their passion at the moment? 6. Address the person by name. We get many pitches daily here at WritetoDone. You’d be amazed how many pitches start with ‘Dear blogger,’ instead of using my name or the name of my Associate Editor (both of which are on the About page). 7. Say what drew you to the person you’re addressing. The reason why I’m so excited about your work is because you write with depth and elegance. For example, I was inspired by your article SXG.com. It changed the way I approach writing. 8. Introduce yourself, but don’t make a meal of it. 9. Briefly list recent gigs. You want to make sure that your recipient knows that he or she is in good company. Which well-known blogs have you been published on? Which relevant jobs have you held down? 10. Do some discrete name-dropping. 11. Your tone should be confident, straightforward and respectful. 12. Focus on how you can help the person you are writing to. Are they going on holiday and might need guest posts? Are they expanding their business and might need new staff members? Would their blog benefit from your proposed theme? Have they written a book that you could promote? See if you can make them smile. You might want to say, for example, “I’d like to offer you an in-depth guest post, called ‘zyz.’ It would cover the following points…” Then list the main points of the proposed article in bullet form. It’s good to offer an overview first; don’t write the article and then simply throw it at the other person! 15. Show examples of your work. 16. State what’s in it for them. Why might they like to offer you a guest post, article or job? Sometimes it’s difficult to find something to say. Here are two recent examples: “This guest post will provide a roadmap to a happier life for your readers.” In one instance, I didn’t know what to say. So I said: “What’s in it for you? Well, maybe just the sheer thrill of it!” It worked! 18. Expect to be successful. A positive frame of mind will give you a strong voice. If you believe in yourself, the other person will believe in you too. After all, confidence is infectious. 19. Finish with a call to action. 20. Move on from failure and focus on your next opportunity. Sometimes you won’t get the desired result. Move on. The more pitches you write, the higher are your chances of landing your dream gig. As you can see, there are many things to consider if you want to write the perfect pitch. In particular, being a nice human being, respecting both yourself and the person you are writing to, and considering the needs of others will make for successful pitches. Remember that your pitch is a bridge to another human being. If you create that bridge with integrity, it can lead to an enjoyable and beneficial relationship. And let me remind you of the most important thing: always aim for a win-win solution. As i’m started writing articles for contribute on another site your tips will really help me. Hey!! This will help me for sure. As i’m started writing articles for contribute on another site your tips will really help me. Thanks for sharing!!! The points you touched on in this article are all valid and excellent. Will be adopting many of them the next time I write a pitch. Thanks alot for sharing this. Cheers. Wow, I love that pitch really. I am new guest blogger and this idea would be help me a lot. Thanks for sharing. Creativity bring in writing is not a simple matter. It’s a big deal and we have to work a lot there. A catchy title is the core part of any article or of write up. Good attempt you have done here. This gave me a lot of ideas for my pitch. I am going to try all these soon. Appreciate for sharing. I can truly appreciate you for this wonderful article on writing a perfect pitch. I really enjoyed reading this information as it comes with lots of new thoughts to me when comparing what I have learned so far. I do work for a writing service online (page) but I’m still not in a perfect shape to take on any form of writing. I can say that your sharing, not only this one but also most of the posts, are quite effective for anyone into the writing. Thanks a lot and hop to have learned more things about writing from here. Awesome work, just simply awesome! Your posts are the best I’ve ever seen in my life. It took me a while to get a hang of writing pitches, but I think I have a knack for it, too (like you!). 🙂 If you receive a pitch from me, I might come off as technical and a bit distant, but I guess every writer/freelancer has his/her own tone. I like your examples. They’re warm, personal, and unique to each blog owner. Thank you for sharing these tips with us, Mary. Hoping to connect with you sometime soon. Mary, I get crap emails like the one shown here all the time. I particularly LOVE it when the sender neglects to mention my blog, sends me multiple emails, and fails to have ANY SENSE of who I am. What a waste of my time, having to read these emails and then promptly delete them. But I suppose it goes with the territory. On another note, I love how you have simplified the pitch process with this post. I am going to share this for sure. I’m also going add a link to this to my guest-posting page, where Wording Well’s guidelines are outlined. Mary, this is a great list for how to pitch ‘right.’ I love #18, not just for pitches, but for everything in life. Mary, this is a great list of how to pitch right. I love #18, not just for pitches, but for everything in life. this came at a good time for me since I am trying to do better with my own blog. How often do you suggest you try to guest blog? Also if you how do you get around the point if you are just starting out and have not done any guest posting yet and you have a small list? This would mean there would really mean there is not much if any benefit for allowing you to guest blog. I am guessing that I would just leave out those steps and give links to a few of my articles? Thanks again for such a timely article, and by the way my sister (who unfortunately I haven’t seen in a long time) lives in Auckland so that made me smile when I heard that is where you are from. I say heard since I am legally blind and use a screen reader. Thanks again and I hope you’re having a great day! Thank you Mary for your helpful article. I have two questions. 1) How do you find the right person to write to for requesting a guest post if they are not listed. Ex. Huffington Post? 2) What if you have not yet published any guest posts anywhere? Right now my writing is on my blogs, on Medium and Linked In and I write a column for a local magazine. But no guest blog posts. It is my goal for the next month to begin to pitch so your article is very timely for me. Good comment, Janet! Yes, you really want to check your pitch email for “speling and gramar”! The main thing is to keep going. Even if you only ‘get’ 1 in 10 guest post gigs, that’s okay. Keep on sending out your pitches. Another point to remember is to target blog or websites that are only a little bigger than yourself. For example, if you have 100 subscribers, you could comfortably pitch to a blog which has between 1,000 and 2,000 subscribers. But you may not be able to land a guest post on a bigger blog. Mary, thank you for sharing these tips. I tried to write pitches for different sites but, unfortunately, I received only a few answers. I think your guide will help me to write perfect pitches. One of the reasons for passing the pitch also can be a grammar. For example, inappropriate using of commonly misused words http://www.smartpaperhelp.com/blog/word-fails-were-all-guilty may create a defective impression. That’s why it’s important to check the letter several times before sending it.